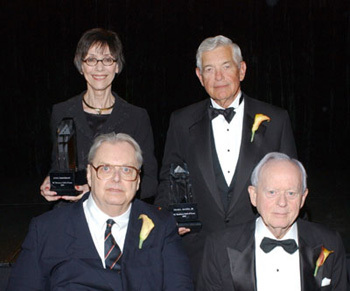 Since being started in 1988, the North Carolina Business Hall of Fame has inducted 68 men and women into the hall. 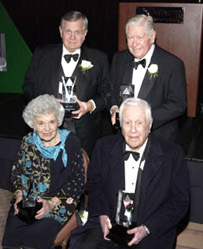 These individuals represent the outstanding North Carolina business and government leaders for the past 150 years. The chronological list of induction is listed below, while the dropdown menu at upper right provides an alphabetic listing of laureates. Junior Achievement Beginning this year, we will begin adding business histories of laureate firms and other significant business enterprises in the history of North Carolina. Richard Joshua Reynolds, Founder, R.J. Reynolds Tobacco Co.
Joseph McKinley Bryan, Founder, Jefferson Standard Broadcasting Co.
James Buchanan Duke, Founder, Southern Tobacco Co.
Thomas Henry Davis, Founder, Piedmont Aviation, Inc.
Robert M. Hanes, President, Wachovia Bank & Trust Co.
Dr. Asa T. Spaulding, President, NC Mutual Life Insurance Co.
Ralph W. Ketner, Co-Founder, Food Lion, Inc.
Philip Lance Van Every, Chairman, Lance Inc.
George Watts Hill, Sr., Chairman, Central Carolina B & T Co.
Edwin A. Morris, Sr., President, Blue Bell, Inc.
John F. Watlington, Jr., Chairman and CEO, Wachovia Corp. Rush S. Dickson, Chairman, R.S. 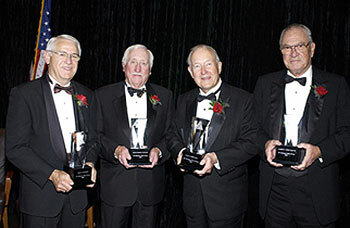 Dickson & Co.
Charles F. Myers, Jr., Chairman & CEO Burlington Industries, Inc.
Shearon Harris, Chairman & CEO, Carolina Power and Light Co.
John Grimes Medlin, Jr., Chairman of the Board, Wachovia Corp.
William States Lee, Chairman & CEO, Duke Power Co.
D. Jones "Doc" Thurston, Jr., Founder & CEO, Thurston Motors and Thurston Aviation, Inc.
Thomas M. Belk, President, Belk Stores, Inc.
Claude S. Ramsey, Jr., Chairman & CEO, American Enka Corp.
John M. Belk, Chairman of the Board and CEO, Belk, Inc.
Edward E. Crutchfield, Jr., Chairman & CEO, First Union Corp.
James J. Harris, President, James J. Harris & Co.
Wayland H. Cato, Jr., Chairman Emeritus, Cato Corp.
Albert F. "Pete" Sloan, Chairman & President, Lance, Inc.
Joan Zimmerman, Chief Executive Officer, Southern Shows, Inc.
Bert Collins, Chairman, NC Mutual Life Ins. O. Bruton Smith, CEO, Sonic Automotive Inc. & Speedway Motorsports, Inc.
Chairman, NC Mutual Life Ins. William A. V. Cecil & W. David Stedman. 2006 Copyright. CommunicationSolutions/ISI for web site and content. Junior Achievement of the Carolinas, Inc.